Former international footballer George Weah will win Liberia's presidency, according to provisional results released by the National Elections Commission. With 98% of votes counted, Weah has the majority of support in Tuesday's run-off. The elections commission says Weah received 61.5% of the votes counted, while Vice President Joseph Boakai got 38.5%. The two were vying to replace Africa's first female president, Nobel Peace Prize winner Ellen Johnson Sirleaf. The vote is the first time in more than 70 years that the West African nation founded by freed American slaves is seeing one democratically elected government hand power to another. Final results are expected on Friday. 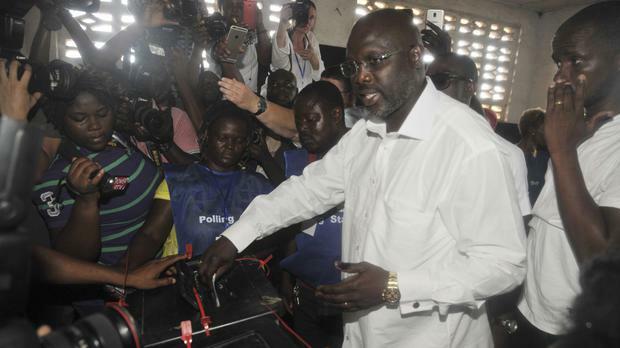 Weah led the first round of voting on October 10 but did not get enough votes to win outright. Weah, 51, played for clubs including AC Milan, Chelsea and Manchester City, and entered politics after his retirement, becoming a senator. Neither he nor Mr Boakai, who has been vice president for 12 years, made any public comment after the provisional results were released. But Weah's party members were already celebrating, even though results from four of Liberia's 15 counties were yet to be released. Armed guards surrounded the NEC headquarters before the announcement of the results. The commission said 56% of the country's 2.2 million registered voters cast ballots in the run-off vote.